ASK FOR OUR FREE CATALOG OF PLASTIC & METAL HARDWARE! We have been in business since 1986, and we pride ourselves on providing customers with the best-quality products along with personal service at competitive pricing. 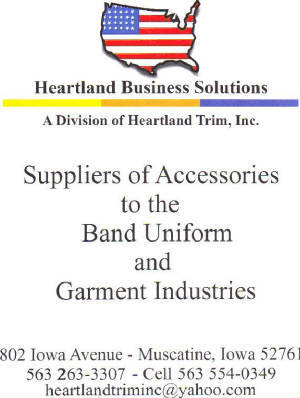 You can order from us using our online catalog, or via email at heartlandtriminc@yahoo.com. 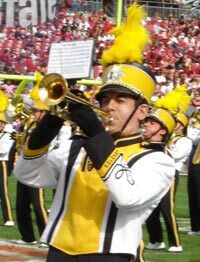 We look forward to serving you and helping your company increase its profitability and stature in todays Marching Band Uniform market! We take an enormous pride in developing our product line, and hope that you will find something in our catalog that you like. We also can create custom orders; call or email and let us know how we can serve you better. Call or email now, we look forward to becoming part of your support team. We have had over 36 years of experience in the fields of garment, uniform, and related accessory industries. Whether your a major uniform manufacturer or a local University supply house for uniform garment repair and refurbishment. Let our staff help you supply quality products at affordable prices. Heartland Trim is not a retail store, and may only be reached by mail, phone, email or this website. Our hours are from 9:00AM - 5:00PM daily Monday through Friday except for Holidays.